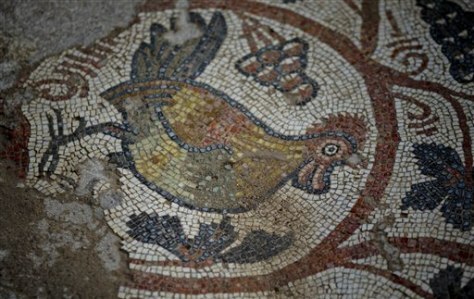 A detail of a mosaic in the archaeological site where an ancient church was found in Hirbet Madras, central Israel, Wednesday, Feb. 2, 2011. Israeli archaeologists say they have uncovered a 1,500-year-old church, including an unusually well-preserved mosaic floor with images of lions, foxes, fish and peacocks. According to Amir Ganor of the IAA (Israel Antiquities Authority) the church in the hills southwest of Jerusalem was active between the fifth and seventh centuries A.D.